The collaboration between Akira Sakata (JP, sax, clarinet, voice, 1945) and Nicolas Field started in 2008 with a concert at Cave12 in Geneva (CH). 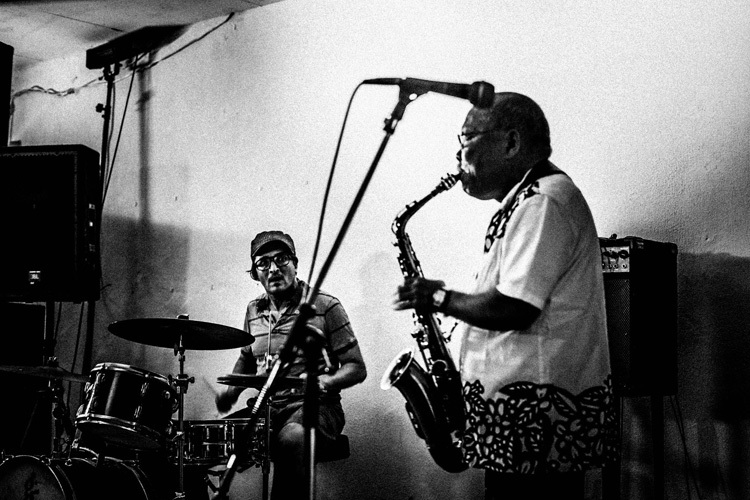 The music of the duo Field & Sakata is strongly rooted in the free-jazz tradition. Sakata plays his saxophone with an assertive lyrical intensity and at times even with rugged power. The drums respond and talk back to Sakata’s flow, trying to meet all the expressive needs of the music. Thus using and extended sound palette added to the drums. Wood as well as metal is struck, rubbed and scraped to interact with the intensity of the horn, so that the two instruments complement each other to form a sensual, energizing and delightful sound mass. In 2018, marking ten years of playing together, the duo released, "First Thirst" on the Nottwo label and toured Japan during the summer.